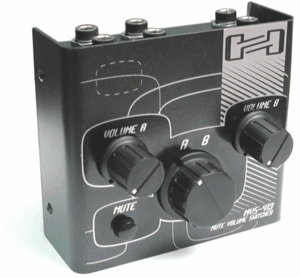 The Hosa MVS-413 Audio Signal Selector with Volume And Mute is a Line-Level (not after amp) audio signal selector with independant volume control for each channel and a mute button. Perfect switching between two sets of powered monitors. One Left & Right INPUTS, two Left & Right OUTPUTS.